That Which Binds Us (TWBU) is a josei otome visual novel centered around a young woman named Evalise. The full game is over 5 hours long and contains a new game+ featuring an alternate story line as well as choices later on that affect dialogue. This game was originally made on RPG Maker MV for the Indie Game Maker Contest game jam in September 2017, but has since been ported to Ren'Py and has been heavily extended. Feel free to comment below or email me with any comments or concerns! 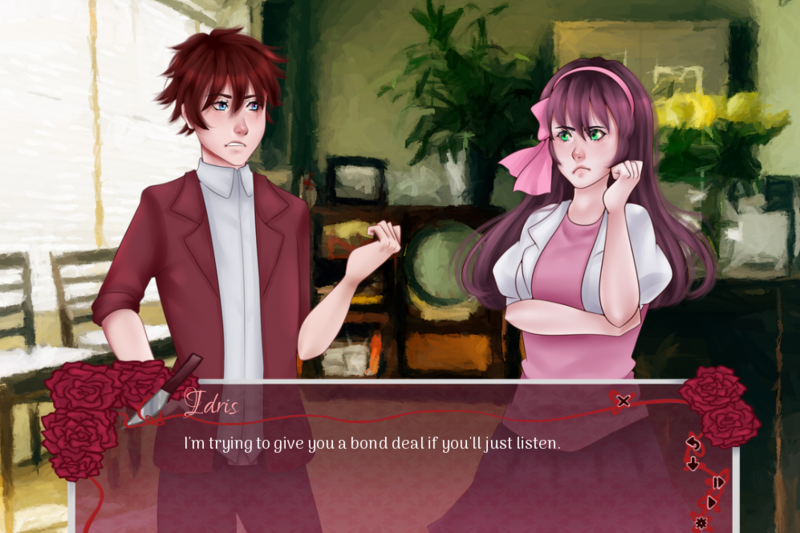 The extended demo is now here just in time for Valentine's! It includes several more scenes that better flesh out what the full game will be about and has improved graphics. The full game is now released, with a discounted launch price of $8.09! A new version of the full game is now up- it fixes a few grammar errors. Dude, you should REALLY get an artist if you want to show your games to a wider audience. 7 bucks are A LOT of money on steam for a game with such poor art in comparison to how professional games look. no offense. I finally got around to playing the demo. It's soooo good! I really like the intrigue you've put into it so far. Idris is a really interesting character and I wonder how the storyline will develop from here on out.